Monitor2USB, Monitor Controller from Behringer. The Behringer Monitor2USB is designed for home studio musicians who need to monitor either with headphones and speakers. They can connect two headphones, each with their own amp and volume control, as well as up to three pairs of monitors. The Monitor2USB also hosts a USB audio interface with two stereo inputs as well as an additional Mix Monitor input for your DAW. 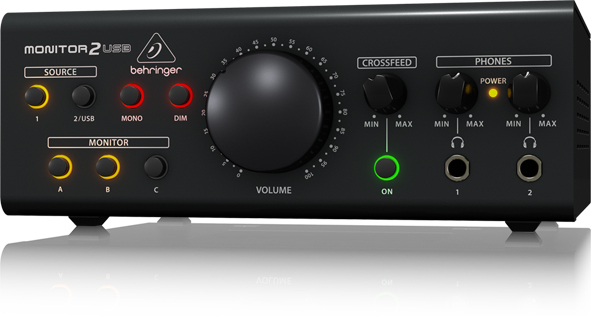 Behringer installed a large volume knob with VCA control, Dim and Mute features and a Panorama control emulates the monitor stereo pan in the headphones. The Behringer Monitor2USB has an MSRP of $199.99. 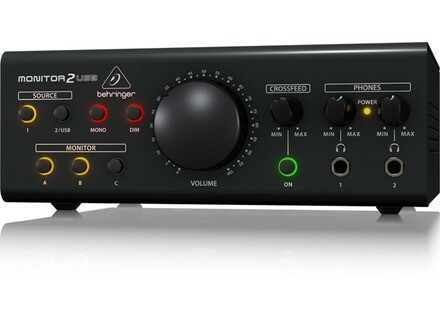 More info at www.behringer.com.